Lobsters being sorted on the dock near the cruise boat. (New Harbor, ME) My wife and I took the Puffin Watch organized by Hardy Boat Cruises out of New Harbor on Tuesday night. The pilot of the 60-foot boat called the trip “memorable” and that it was. 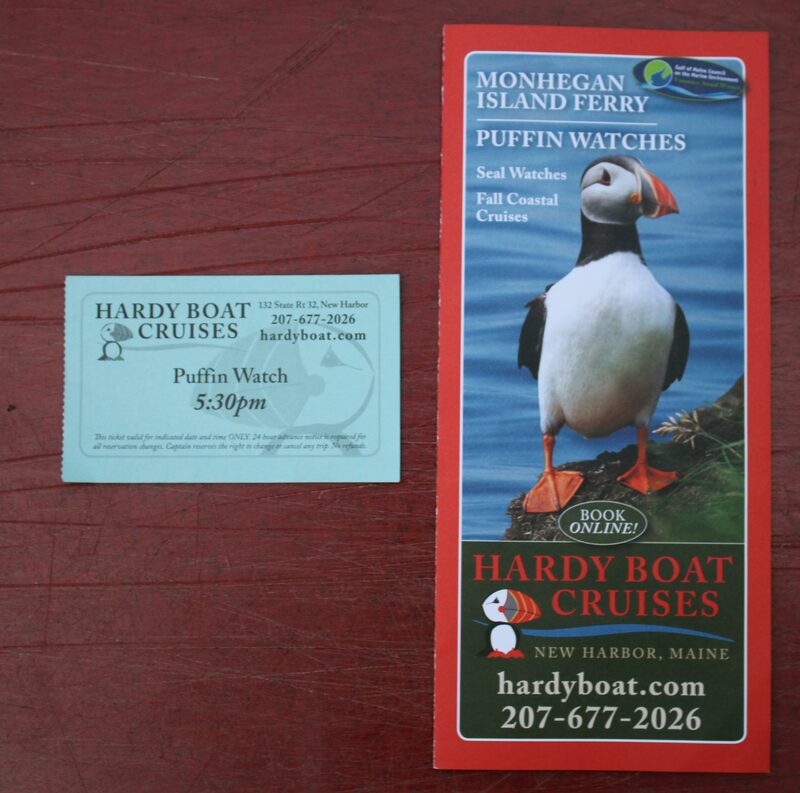 The daily puffin watch cruise leaves the harbor at 5:30PM and returns 1 ½ hours later. And that’s exactly what we did. The idea is to cruise out to Eastern Egg Rock, see some puffins, and then head back. That part didn’t go quite as smoothly! The harbor was calm but as we exited, the wind and waves picked up. As we got out near the place where the puffins are located, there was thunder, lightning, and then rain. Viewing puffins went from primary importance to secondary importance. The folks on the upper deck were told to move in with us on the bottom deck to escape the bad weather. Meanwhile, we are trying to see puffins! 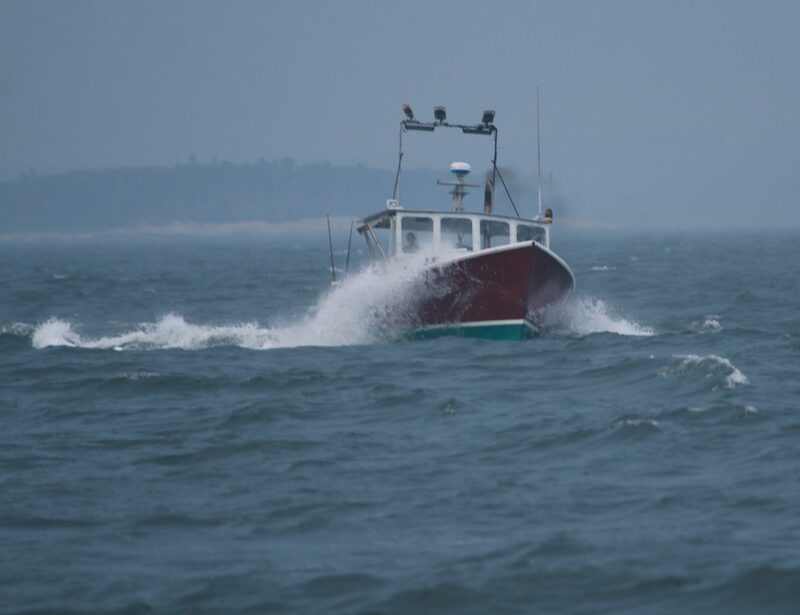 The boat is rocking, the waves are rolling, and it’s darker than usual. 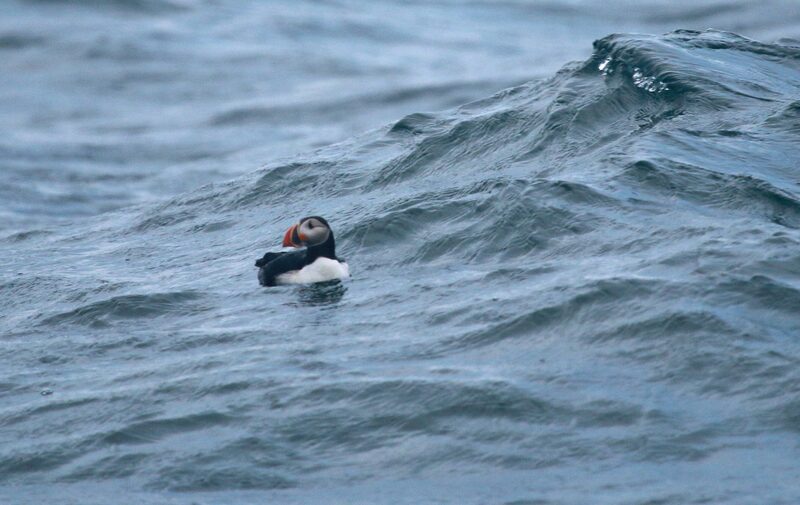 Did I mention that puffins are small (less than a foot long), fly fast, and look in lesser light like other birds? My original intention was to get some nice puffin shots. I had my mopod and my 400m lens. The conditions changed my plans considerably. The close quarters, the rolling waves, and the darkening skies were not favoring my plans to sight and photograph a puffin. Most people were on the side of the boat between it and the puffin island. Made sense. I was on the other side and was surprised to see some birds in the water. I couldn’t tell what type of bird they even were because of their distance from the boat, but I started shooting them as quickly as possible. I didn’t know until hours later that the little birds I was shooting were indeed puffins. Talk about dumb luck! People brought infants along and someone even had a dog with them. What was in it for them? Parking was ¼ mile away from where you got the boat and there were no sidewalks. Not easy walking. Puffins are very small and are not easy to identify from a boat that was yards from them. That picture on the brochure could have been of one of those Made-in-China puffins! I didn’t get sick during the rolling conditions but plenty of other folks had a miserable trip because of the conditions. All those suffering folks wanted was off the boat. However, all is well that ends well. Everyone made it back to the New Harbor dock safely and I ended up with some shots, though poorly focused, of some puffins. 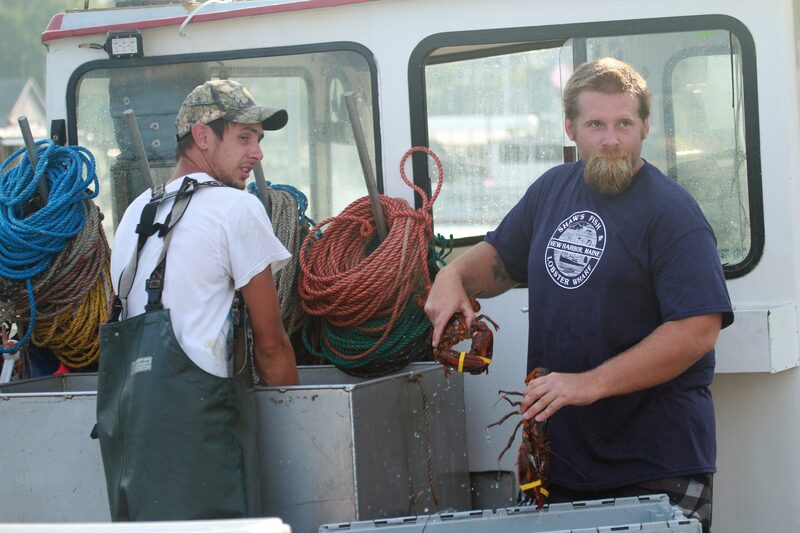 We did see some lobsters getting sorted on the dock near the cruise boat.